When does the eclipse occur? Some information lists the eclipse occuring on 13th November, 2012, others list 14th November, 2012. Which is correct? Both are correct. There is only one eclipse but the date & time depend upon the time zone or standard you choose to express the time in. It is standard practice for the times of all astronomical events to be expressed in universal time. Universal time is the local time at zero longitude (Greenwich, England). The total phase of the eclipse begins at 20:38UT on November 13th. To get Cairns local time you need to add 10 hours. So the events Cairns local time translates to 6:38am on November 14th. For simplicity and ease of use for non-astronomers, I've tried to use Cairns local time exclusively in this document. If you link to sites like the NASA solar eclipse home page, times will be expressed in universal time(UT). These contact times were generated using Bill Kramer's eclipse calculator. The times listed incorporate lunar limb profile corrections. Total duration is 2 minutes and 2.7 seconds. Total duration is 2 minutes and 3.1 seconds. Total duration is 2 minutes and 3.4 seconds. Total duration is 2 minutes and 1.9 seconds. Total duration is 2 minutes and 1.7 seconds. Total duration is 2 minutes and 1.1 seconds. Total duration is 2 minutes and 1 seconds. Total duration is 2 minutes and 0.9 seconds. Total duration is 1 minutes and 59.8 seconds. Total duration is 1 minutes and 59 seconds. Total duration is 2 minutes and 0.7 seconds. Total duration is 2 minutes and 0.1 seconds. Total duration is 1 minutes and 59.7 seconds. Total duration is 1 minutes and 58 seconds. Total duration is 2 minutes and 2.6 seconds. Total duration is 1 minutes and 58.8 seconds. Total duration is 1 minutes and 40.2 seconds. Total duration is 28 seconds. Total duration is 1 minutes and 46.1 seconds. Total duration is 43.7 seconds. Total duration is 24.9 seconds. Very dangerous to look at thin crescent eclipse. 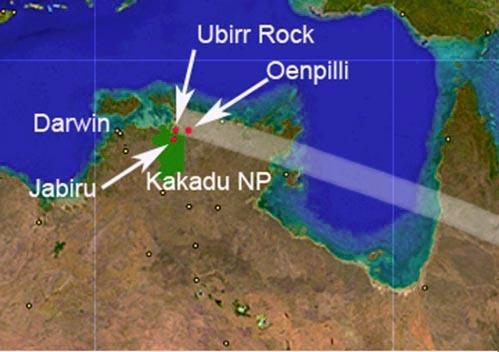 Touchdown of the shadow occurs north of the east border of the Kakadu National Park, north west of the Aboriginal settlement of Oenpilli. The shadow then travels out across Arnhem Land, crosses into the Gulf of Carpentaria coast at the north end of Blue Mud Bay. 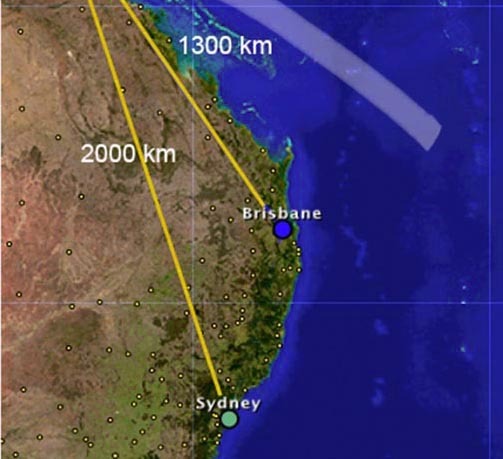 It strikes land again on Cape York Peninsula near Wallaby Island. 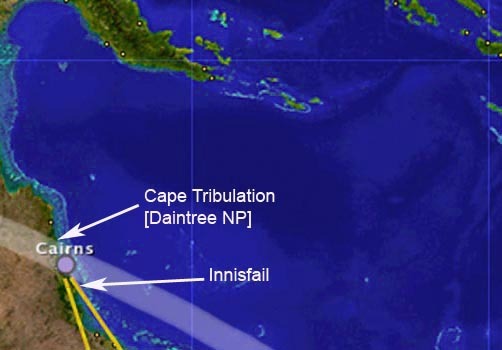 The centreline crosses the Eastern coast 30km north of Cairns about halfway between Cairns and Port Douglas. This map is a low resolution illustration and only intended to show the relative positions of places mentioned in the text. A number of individuals put a lot of effort into producing much higher resolution maps and predictions of all eclipse paths so I won't duplicate their efforts. Detailed maps and eclipse ephemerides can be downloaded from the NASA eclipse home page maintained by Fred Espenak. Detailed weather predictions and maps can be downloaded from Jay Anderson's web site. If you have Google Earth on your computer, eclipse paths (.kmz files) can be down loaded then overlaid onto Google Earth from Xavier Jubier's web site. These come with an interactive tool that calculates eclipse circumstances for the point at the centre of the screen. Bill Kramer's Eclipse Chasers web site has an online php calculator for calculating local circumstances for this eclips. You can select a location from a map or type in the latitude/longitude. It incorporates lunar limb profile corrections. The calculator produces a graphic of Baily bead predictions that can be viewed at the bottom of the calculator page.